Brighton’s first lifeboat, paid for by the town, was established in January 1825 in a cave by the Chain Pier ; it was soon moved to a boathouse below Middle Street and was operated until 1837, but unfortunately records of its launches have been lost. A replacement boat was installed the same year, but in 1854 it was sold to pleasure boat operator John Wright who used it as a private lifeboat for at least five years. By 1857 though, there was another replacement town boat and also a vessel of the Royal Humane Society, making a total of three lifeboats on station at Brighton. 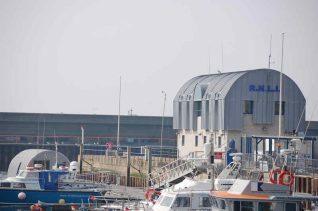 Following a dramatic rescue from the Pilgrim in October 1857 which involved all three boats, the first Royal National Lifeboat Institute (R.N.L.I.) boat in the town, of unknown name, was installed in 1858, but it was replaced on 1 October 1867 by a larger boat, the Robert Raikes, in a new boathouse below the Bedford Hotel . Named after the founder of the Sunday School movement (because Sunday school children in Brighton and London had collected £580 in pennies towards it), the Robert Raikes was itself replaced by the RobertRaikes II in 1874. In 1879 a new town boat was installed, the JohnWhittingham, and in February 1888 a new R.N.L.I. boat, the Sunlight No.2, was donated by Lever Brothers Ltd and operated from a new boathouse at arch no.109 (below Cannon Place) until December 1904 when it too was replaced by the William Wallis. This last Brighton offshore lifeboat of the R.N.L.I. was launched thirty-four times and saved twenty-two lives before the station was officially closed on 7 July 1931. The town’s John Whittingham continued from arch no.111 until August 1932. Plaques at arches 109 and 110 now record the gift of the Robert Raikes and the location of the R.N.L.I station. Brighton is now covered by offshore boats at Newhaven and Shoreham, but in 1965 the R.N.L.I. stationed an inflatable Atlantic 21-type inshore rescue boat just to the east of the Palace Pier ; it was removed to a pontoon at the western end of the Marina in 1976. 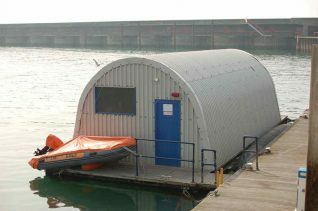 The boat covers the area from Peacehaven to Hove Lagoon , and by 1988 had saved 144 lives. In the fishing museum in Brighton is an old picture of the lifeboat crew. One of them is Hummy Downs, real name Humphrey Downs my Great, Great Grandfather.